The only part that is remaining is the subwoofer. I haven't heard great things about the Klipsch SW110 - pros/cons? Also any other sub in the 500 dollar region that would be really good? I've heard a lot about the SVS Subs. Room is 400sqft and is a perfect square. It has marble flooring and a lot of hardwood/glass furniture. Also would the new klipsch reference subs be any good? KLIPSCH R10SW/R12SW? There are no reviews since I believe they are yet to be released? Sorry, I should have posted budget. They're looking at no more than 500USD for the subwoofer. Also the room size is approx. 400 square feet and is a perfect square. The things that I am most concerned about is getting a clean bass response as the flooring is marble and furniture is either hard wood/glass surface. Would the new line of reference subs from klipsch be any good? The R10SW/R12SW? They wont need crazy output but rather a nicely balanced system. Any recommendations based on that would be great. That's a big room. So I would do one of two things. Cleaner sound and little less output from the Svs PB-1000. Or you could get smoother response from a pair of bic pl-200's. They are good subs I've owned one before. The Svs will be a bit cleaner sounding sub but also won't have quite the output of the pair. If it were me, my budget, my room, my everything and I had space, id pick the dual pl-200's. If they only want one sub the PB-1000 is the answer in my opinion. Oh and I haven't heard the new Klipsch but I would just steer clear till they come it with the new higher offerings. Alright, I'll look into the SVS. I do believe you when you say the SVS gives a very clean sound since I've heard a lot about them. Random question, would you know if the PB-1000 is dual voltage? Meaning can it run 110-240v? Also another question, I see SVS make a Sealed sub in the same price range. The SB-1000, which one would you think is better? I read a lot about people saying that sealed subs give a much clearer sound. And given the size it would be perfect in terms of placement. Any thoughts? Sealed vs ported is a bunch of BS. If it's a quality subwoofer it will sound good regardless. I will say you will give up a good amount of output going with the sealed. If you are limited in size then there is nothing you can do but I would personally stay away from sealed unless you at going with at least a 15" woofer. Each has their own characteristics, strengths and weaknesses. Sealed will naturally be better for critical listening due to less phase issues among other things but will roll off sooner due to design. Ported will give a better bottom end but port noise can be an issue and frequencies below port tuning can result in overexcursion of the cone. Between the two i would choose sealed for music & ported for movies. Myself, i have moved on to bigger and better things. Horns rule. Doing more research it seems both of you are right. Sealed will not give as much bottom end as ported and sealed will be better for music. After weighing the pro's and con's I simply have to consider size with the ported sub. I feel for the needs of my parents the ported would work great as they mainly watch movies. Only issue remaining is size. Would the SB-1000 (sealed) not be powerful enough for a large room? If it's not then I guess ported it is. Well technically sealed will go much lower. But you have to have the woofer and wattage to do it. My 4 18's play down to 8 hz. However it's 4 18's and I have quite a bit of power to do it. To your question, hands down I would not even think about the sb-1000 in a room that size. PB-1000 all the way. I actually would do a pair on PB-2000 prolly in a room that size. However you have a budget and the PB-1000 fits it. Go with it and they will be very happy I'm sure. Looking at it and reading reviews online the SB-1000 definitely seems too small for a room that size. Actually the PB-1000 seems a little small as well. But you are right, I have a budget and well to be honest there is no end to spending when it comes to high end audio; as i've learnt this past month. I don't believe they would have the room to fit 2 subs as you suggested earlier. Just a question if I were to go with two subs then would placement of both relative to each other be a factor? Either way that question is more for my own curiosity. Thanks a ton, I believe I will be going with the PB-1000. The Premiere Acoustic PA 150 is in their budget and can fill a big room. Piano gloss black, for some good looks in the room. Either of the SVS subs mentioned would be a much better choice than the Premiere Acoustic PA 150. I was initially looking into the Premiere Acoustic Sub as a few online retailers seem to throw it in "free" with a klipsch 5.1 package. Although as Jason mentioned despite its great output it isn't considered to be as clean or as smooth a sub as either of the SVS subs. 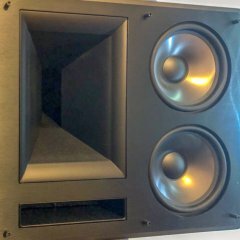 Thanks for the suggestion, but as it is for my parents I believe a lower output but cleaner sub should do the trick I'm trying to push them to consider the SVS SB-2000 although with the price difference of 300 dollars its a long shot. If you don't mind doing a little work this would be a great option as well. Cant find any data on the SVS besides what's listed on the websight and some reviews with little information, without knowing the specs for the driver it would only be a guess at best. The Dayton is $100 cheaper and the Titanic is a great driver but both the sealed versions (SVS vs. Dayton) i would expect fairly similar results. If you have some woodworking skills $500 would get you a much better subwoofer and i would be happy to help out with driver selection, box & amp purchase if you're willing to get your hands dirty. Again I'd steer clear of the sb-2000 if you can spend that much go for the PB-2000. Like I said the output is low with the small sealed subs. Now if you went to the sb-13 ultra that would change a bit. But much higher budget. Yea, I figured. I understand SVS allows you to audition the sub woofer in your home and if you don't like it theyll take it back including return shipping? My plan is to get the PB-1000 and if that seems like it's not enough then I would have more ways to convince them to get the PB-2000 since they would be able to experience it first hand. Thanks for the advice.